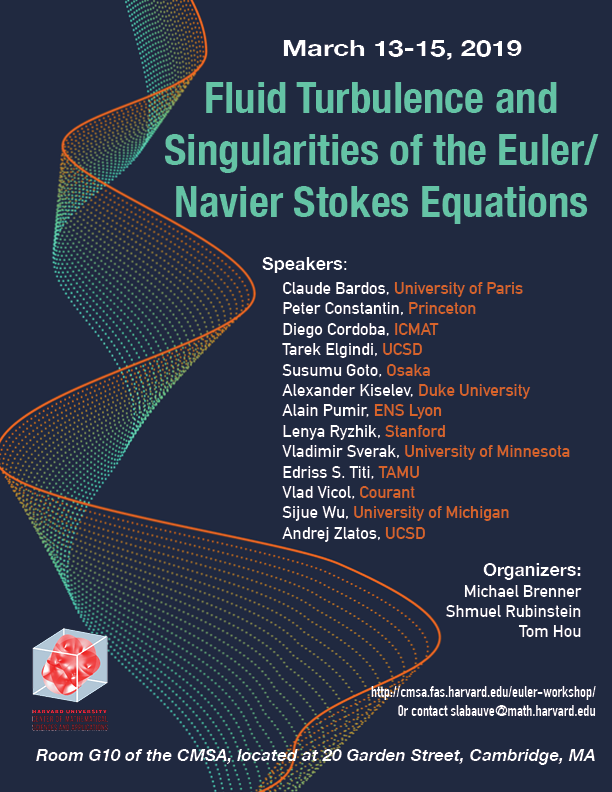 The Workshop on Fluid turbulence and Singularities of the Euler/ Navier Stokes equations will take place on March 13-15, 2019. This is the first of two workshop organized by Michael Brenner, Shmuel Rubinstein, and Tom Hou. 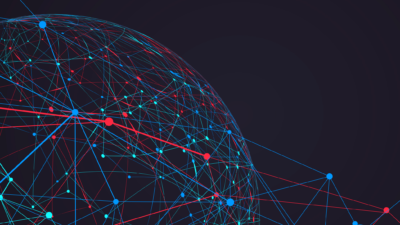 The second, Machine Learning for Multiscale Model Reduction, will take place on March 27-29, 2019. Both workshops will be held in room G10 of the CMSA, located at 20 Garden Street, Cambridge, MA. Abstract: I’ll discuss compactly supported smooth solutions of 3D incompressible Euler equations inspired by and explaining the remarkable recent construction of Gavrilov. Our construction is based on the Grad-Shafranov equation. Multiscale Euler flows and synthetic examples of zero law of turbulence states in arbitrary open domains will be discussed. This is joint work in progress with Vlad Vicol and Joonhyun La. 9:55 – 10:40am Claude Bardos, University of Paris Title: The Kolmogorov 1/3 Law, the Onsager Conjecture and the Kato Criteria for zero viscosity limit. Abstract: A report on ongoing work with Edriss Titi and other coauthors. The notion of weak convergence for Navier-Stokes and Euler equations presents many similarities with the notion of average in the statistical theory of turbulence. In particular the counterpart of Kolmogorov 1/3 law was the Onsager “Holder 1/3″ conjecture. Around 1994 it was proven by Constantin, E and Titi that the 1/3 Hölder regularity implies the conservation of energy. The interest of such issue was recently emphasized by the construction, of wild solutions of Hölder regularity less than 1/3 that do not conserve the energy (Issett , Buckmaster, De Lellis, Szekelyhidi Jr., and Vicol). However one can also observe very easily the existence of some other type of solutions not regular at all that do conserve the energy. Hence the two points of view are not complementary. But in the zero viscosity limit in the presence of a no slip boundary one observes, thanks to a theorem of Kato, that the conservation of Hölder 1/3 regularity then is equivalent to the absence of anomalous energy dissipation. This will be the object of my talk which requires the consideration of the Onsager condition in the presence of boundary and several extensions of the theorem of Kato now dubbed the Kato Criteria. Such criteria underlines the contribution of no slip boundary condition in the creation of a turbulent boundary layer which contributes to the resolution of the d’Alembert paradox. Abstract: I will discuss a new result on the existence of a stationary solution with a fluid-squeezing singularity for the two-fluid Euler equations. Abstract: High-Reynolds-number turbulence is composed of a hierarchy of multi-scale vortices. In textbooks of turbulence, the generation mechanism of the hierarchy is explained in terms of the so-called energy cascade. To reveal the concrete image of the hierarchy of vortices and its generation mechanism, we have conducted simulations of turbulence by numerically integrating the Navier-Stokes equations for incompressible fluids under two different boundary conditions. One is turbulence in a periodic cube, and the other is a turbulent boundary layer. In both flows, turbulence, far from solid walls, is composed of the hierarchy of coherent vortex tubes, and smaller-scale vortex tubes are created by being stretched in straining regions around larger-scale vortices. The role of anti-parallel pairs of vortex tubes is also discussed in the talk. Abstract : Fully turbulent flows are characterized by intermittent formation of very lo- calized and intense velocity gradients. These gradients can be orders of magnitude larger than their typical value and lead to many unique properties of turbulence. Using direct numerical simulations of the Navier-Stokes equations with very high small-scale resolution, we characterize such extreme events over a significant range of turbulence intensities, pa- rameterized by the Taylor-scale Reynolds number (Rλ). Remarkably, we find the strongest velocity gradients to empirically scale as τ−1K Rβλ, with β ≈ 0.775 ± 0.025, where τK where τK is the Kolmogorov time scale (with its inverse, τ−1K , being the r.m.s. of velocity gradi- ent fluctuations). 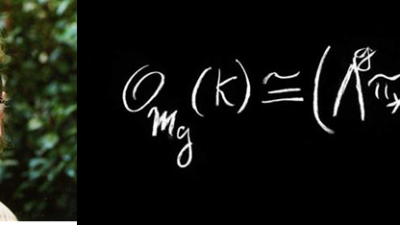 Additionally, we observe velocity increments across very small distances r ≤ η, where η is the Kolmogorov length scale, to be as large as the r.m.s. of the velocity fluctuations. Both observations suggest that the smallest length scale in the flow behaves as ηR−α λ , with α = β − 1/2, which is at odds with predictions from existing phenomeno- logical theories. We find that extreme gradients are arranged in vortex tubes, such that strain conditioned on vorticity grows on average slower than vorticity, approximately as a power law with an exponent γ < 1, which weakly increases with Rλ. Using scaling arguments, we get β = (2 − γ)−1, which suggests that β would also slowly increase with Rλ . We conjecture that approaching the limit of infinite Rλ → ∞, the exponent γ tends to 1, restoring the symmetry between strain and vorticity. 9:50 – 10:35am Vladimir Sverak, University of Minnesota Title: Singularities and their stability in various models. Abstract: We will discuss models (mostly 1d with non-zero viscosity) with both stable and unstable singularities, together with effects of the singularities on uniqueness. Issues concerning the full Navier-Stokes equations will also be mentioned. Abstract: In this talk I will discuss some recent progress concerning the Navier-Stokes and Euler equations of incompressible fluid. In particular, issues concerning the lack of uniqueness and the effect of physical boundaries on the potential formation of singularity. In addition, I will present a blow-up criterion based on a class of inviscid regularization for these equations. Abstract: We consider applications of the method of convex integration, to the Navier-Stokes and related equations. Topics discussed include the nonuniqueness of finite energy distributional solutions for the system. Abstract: When the velocity is not a priori known to be globally almost Lipschitz, global uniqueness of solutions to the 2D Euler equations has been established only in some special cases, and in all these the diffuse part of the vorticity is constant near the points where the velocity is insufficiently regular. Assuming that the latter holds initially, the challenge is to propagate this property along the Euler dynamic via an appropriate control of the Lagrangian trajectories. In domains with corners whose angles are all less than $\pi$, and sufficiently smooth elsewhere, the velocity fails to be almost Lipschitz only near any obtuse corners. We show for these domains that if the vorticity is initially constant near the whole boundary, then it remains such forever (and global weak solutions are unique). We also show that this may fail for domains with corners that have angles greater than $\pi$. Abstract: We will briefly review recent results on singularity formation for strong solutions to the incompressible Euler and Boussinesq systems obtained with In-Jee Jeong. Then we discuss a more recent construction of finite time singularity for more regular solutions. Abstract: De Gregorio introduced the model ωt + uωx = uxω, a variant of the Constantin-Lax-Majda (CLM) model ωt = ωHω, to study the convection and vortex stretch effect of the 3D Euler equation. In this talk, we will show that the De Gregorio model on the real line develops a finite time self-similar singularity from smooth compactly supported initial data using a dynamical rescaling approach. We also study the modified De Gregorio’s model ωt + auωx = uxω for a > 0 and show that the C α self-similar solutions of the CLM model is stable in some suitable functional space. As a result, we can construct compactly supported C α initial data that have finite energy, i.e. ||u||2 < +∞, and develops a self-similar singularity in finite time. It improves the result recently obtained by Elgindi and Jeong. Due to the stability result and that the singularity develops near the origin, we can prove that such initial data also lead to finite time singularity of modified De Gregorio model on the circle. Finally, we will talk about the viscous De Gregorio model and present the blowup result for a close to ½ and a criterion for global well posedness. This is joint work with Thomas Hou and De Huang. Abstract: Whether the 3D incompressible Euler equation can develop a singularity in finite time from smooth initial data is one of the most challenging problems in mathematical fluid dynamics. This question is closely related to the Clay Millennium Problem on 3D Navier-Stokes Equations. In a recent joint work with Dr. Guo Luo, we provided convincing numerical evidence that the 3D Euler equation develops finite time singularities. Inspired by this finding, we have recently developed an integrated analysis and computation strategy to analyze the finite time singularity of a regularized 3D Euler equation. We first transform the regularized 3D Euler equation into an equivalent dynamic rescaling formulation. We then study the stability of an approximate self-similar solution. By designing an appropriate functional space and decomposing the solution into a low frequency part and a high frequency part, we prove nonlinear stability of the dynamic rescaling equation around the approximate self-similar solution, which implies the existence of the finite time blow-up of the regularized 3D Euler equation. This is a joint work with Jiajie Chen, De Huang, and Dr. Pengfei Liu.